I took this photo the other morning on my walk back to my Brooklyn apartment. As I stood looking at the “one way” sign and waited for the “walk” signal to turn, a question popped into my mind. 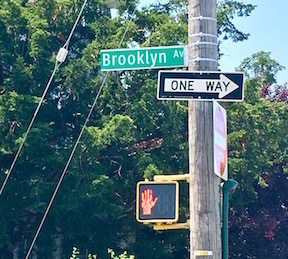 If I were standing at an intersection like this where I came upon a one-way street and had to choose only one way to walk along it for the rest of my life, which way would I turn? Let’s say that turning to the left meant that my movement in that direction would, for the most part, move me away from what matters to me (my values). Conversely, turning to the right would allow me to engage in action that, for the most part, would help me move toward what matters. The answer seems obvious, doesn’t it? However, in the heat of the moment, when encountering obstacles (e.g., peer pressure, societal norms, self-doubt, negative emotions, difficult thoughts), we tend to act in ways that serve to temporarily allow us to avoid or escape from these unwanted experiences. Have you ever had a not-so-pleasant interaction with a coworker, friend, or family member? I won’t go into detail about one such experience of my own except to say that I had a pretty big a fall-out with someone I had once trusted and considered a close friend. As I’m sure many can relate, broken trust can lead to some pretty intense and undesired emotions and feelings. I recall very vividly feeling my anger in the pit of my stomach; so very heavy, so very intense. It’s not uncommon to react defensively when we are angry and feel we have been accused of something we believe or know is untrue. The habitual “urge” to respond in order to counter a personal attack is a behavior I know all too well, both from my own behavior and from observing this behavior in others. Something different happened this time around, however. First, I was able to notice what was happening, and then I paused long enough to know that this was a potential “hook” or trigger for me. That PAUSE was I needed to see that I would be making an “away move” if I reacted out of habit. Responding to defend myself would probably only serve to make me feel better in the moment, and it might also likely evoke additional, unhealthy interactions. I chose, instead, to take myself outside for a walk and call a friend with whom I knew could relate to my situation. Both of these actions moved me in the direction of taking care of myself, emotionally, and asking for support. Both of these things matter to me, and these are things I have a tendency to avoid. That experience, while it may not seem like anything extraordinary, really drove home the importance of the PAUSE. Noticing what we, ourselves, are experiencing within the context of a situation is a necessary first step, but we must slow down enough to give ourselves the opportunity to pause and consider our next move. In doing so, we are more likely to choose to act in a way that is guided by or aligned with our values. Before we can create new paths for desired, sustainable behavior change, we must notice our current behavioral routines or patterns (i.e., habits). Once we identify these patterns, we can accept responsibility for them and commit to taking small steps to build new habits. Over time, if practiced consistently (and with the understanding that we are likely to slip up now and then), we can replace ineffective and rigid habits with more effective and flexible ones. Slow down, notice, and pause. In the heat of the inevitable future uncomfortable moment, then, we are more likely to choose to act the in a way that reflects our authentic self. Which way would you turn? ← Authentically Me: 10 Fun Facts!